Book this sailing and get special amenities at no extra charge, including an invitation to a private cocktail reception, the services of a Distinctive Voyages host to assist you throughout your cruise and a specially-chosen excursion in Sitka. * The Distinctive Voyages host on this sailing will be Bluegreen Travel Services staffer Carolyn Love. Take a different kind of Alaska cruise next summer. Azamara Club Cruise’s bold itineraries are designed to bring you closer to the snow-capped peaks and abundant waters of Alaska’s islands, inlets and beyond. The ancestral home to five major indigenous groups and site of Russian America, Alaska’s history runs deeper than Klondike gold. Sail to some of the most alluring, unexpected ports the North Pacific has to offer aboard the Azamara Quest, a mid-sized beauty with a deck plan well-suited to the needs of modern voyagers. One of the greatest features of this ship is the large number of staterooms with verandas; there’s nothing better than opening your door to the fresh sea air and views. And because this is a Distinctive Voyages sailing, you’ll get special amenities at no extra charge,* including an invitation to a private cocktail reception and the services of a Distinctive Voyages host, who on this cruise will be Bluegreen Travel Services staffer Carolyn Love. You’ll also enjoy a specially-chosen excursion in Sitka. These excursions, which aren’t available to most passengers on your cruise, are guided by locals who take you deep into the culture to give you a more personal connection to the destination. Ketchikan: Surrounded by lakes, rivers, and streams, the “Salmon Capital of the World” is an angler’s paradise. Hop on a charter and keep an eye out for Ketchikan’s other marine residents, like orca and humpback whales, seals and porpoises. Hike Married Man’s Trail, kayak the Misty Fjords, visit the Totem Heritage Center, and stroll Creek Street for quaint restaurants, bars, gift shops and scenic views. Wrangell: Tucked away in the heart of the Inside Passage lies one of Alaska’s oldest towns. From the native Tlingit people through Russian, British and American occupation, the town’s history is as rich as its natural beauty is breathtaking. Mountains, islands, rainforests and glaciers are all begging to be explored in a place where outdoor adventure is as abundant as glittering gold nuggets once were. 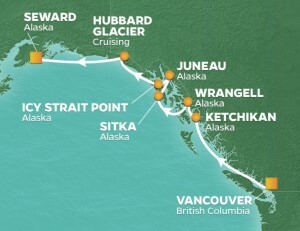 Sitka: Get a Taste of Sitka on your complimentary Distinctive Voyages half-day shore event. You’ll visit the Alaska Raptor Center to learn about its commitment to serving Alaska’s wildlife and get an up-close look at orphaned brown bear cubs, injured bald eagles and other birds. You’ll also stop at Sitka National Historic Park and the Baranof Island Brewery, where you’ll enjoy refreshments. When your excursion is done, you’ll still have free time in port to walk around the city’s downtown and get views of the Blockhouse, Russian Bishop’s House, St. Michael’s Russian Orthodox Cathedral and storied Castle Hill. Juneau: Stretching from the Juneau Icefield to the waterfront downtown, Juneau is a treasure trove of sights. Dig into the city’s gold mining history at Juneau Douglas City Museum, stroll down Historic South Franklin Street, go whale or iceberg watching, tour Mendenhall Glacier and the Tongass National Forest or board the Mount Roberts Tramway for great dining, shopping and easy access to hiking trails. Icy Strait Point: Icy Strait Point is built on the site of a salmon cannery. The restored outbuildings now house a variety of restaurants, a museum and local arts and crafts shops. The port is a cultural hub for the original inhabitants of the area—the Huna people. Enjoy an array of activities indigenous to the area, including native dance performances, brown bear viewings, whale watching, fishing, birding and hiking. Hubbard Glacier: Named after National Geographic’s first society president, Gardiner Hubbard, this frosty-blue glacier is a sight unlike anything you’ve ever seen. The longest ice river in North America, this 76-mile stretch of glacier water meanders its way through Alaska to the Russell Fjord Wilderness. Witness this awe-inspiring phenomenon from onboard, while keeping an eye out for whales, harbor seals and otters. Call 855.645.2215 to Book Your Azamara Club Cruises Alaska Sailing Today! *DISTINCTIVE VOYAGES TERMS & CONDITIONS:: Amenities listed apply only to the first and second passenger in a cabin. Offers are subject to availability, at time of booking, and may be altered or withdrawn at any time without notice. Pricing will be confirmed at time of booking. Cancellations, refunds and penalties are imposed by the individual cruise line. Distinctive Voyages amenities are not guaranteed and may be substituted with a minimum number of guests, as determined by the cruise line, are not confirmed on any given departure. Combinability varies by cruise line. Exclusive Shore events vary by cruise line and are subject to change without notice. See complete Terms and Conditions. Azamara Club Cruises reserves the right to impose a fuel supplement on all guests if the price of West Texax intermediate fuel exceeds US$65 per barrel. The fuel supplement for 1st and 2nd guests would be no more than US$15 per guest, per day, to a maximum of US$200 per voyage. All rates are per person, based on double occupancy, cruise only, in USD, subject to availability, and for individual bookings. Rates may vary by ship, departure date, and stateroom category. All rates, offers and itineraries are subject to change without notice. Offers may be withdrawn at any time. Government taxes & fees are additional. See complete Terms & Conditions. Great Vacation Destinations, Inc., doing business as Bluegreen Travel Services, is located at 4960 Conference Way North Suite 100, Boca Raton, FL 33431. Great Vacation Destinations is an Iowa Seller of Travel No. 688, Washington Seller of Travel, Florida Airlines Reporting Corporation (ARC) registration No. 15-72225-4, California Seller of travel registration No. 2068362 (Registration as a Seller of Travel does not constitute approval by the State of California). Void where prohibited by law and where registration and/or licensing requirements have not been meet. In the event of a conflict between Azamara Club Cruises’ Details of Participation and Great Vacation Destinations’ Details of Participation, Azamara Club Cruises’ Details of Participation shall govern.